TURIN - Eto'o hit the crossbar, but it wasn't enough. Juventus kept a clean sheet and went on to beat Inter 1-0 in the late kick-off, in Week 25 of Serie A 2010/11. Matri scored the all-important goal 30 minutes into the first half following a perfect cross by Sorensen into the centre of the area. FIRST HALF - As we had been told, Leonardo fielded the same team that beat Roma, with Pazzini and Eto'o playing in attack. Delneri had Marchisio back in the team and brought in Toni and Matri as the strike-partners in his 4-4-2 formation. 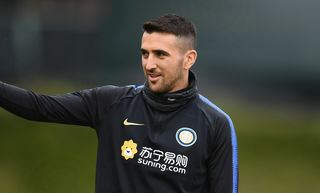 It was Inter who, after 2 minutes of play, penetrated the Juventus area with Sneijder's assist for Pazzini, but a deflection off Sorensen as well as Bonucci closing on him disturbed the Nerazzurri striker and he shot wide. Then, after 8 minutes, Juve made their presence felt for the first time with a cross by Chiellini for Toni who headed over the bar. It was end-to-end and played at great speed at the Stadio Olimpico, except when Juventus stopped things to claim for a penalty after a clash between Cordoba and Matri in the area 12 minutes into the game. Referee Valeri waved play on. In the 26th minute Eto'o showed his skill by trapping on the volley just inside the Juventus area, following a long ball from Thiago Motta. However, Bonucci intercepted and headed safely into Buffon's arms. Juventus took the lead after exactly half an hour: Krasic passed to Sorensen who picked out Matri in the area with a pin-point cross. His header flew past Julio Cesar to give Juventus a 1-0 lead. 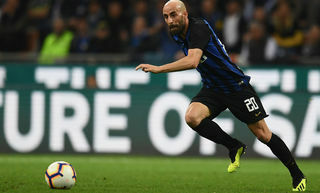 Inter tried to find the reply first of all with a cross by Cambiasso for Pazzini, who handled in the area on 35 minutes, then with Kharja's assist, again for Pazzini, who didn't manage to control the ball. After a minute of added time the first half came to a close with the score at 1-0. It was played at speed but without much to write home about. SECOND HALF - No changes were made to either side during the interval and the second half opened with a marvellous save by Buffon from an equally marvellous header by Pazzini, after Maicon crossed from the right on 49 minutes. The Juventus goalkeeper had to punch the ball clear to ensure Inter didn't draw level. Juventus were dangerous again with Matri heading just wide of Julio Cesar's left post on 52 minutes, following a cross by Krasic. 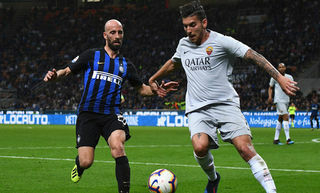 After 54 minutes Maicon's timely challenge on the advancing Matri sent the ball wide for a corner as he found himself with only the goalkeeper to beat. On the hour mark Leonardo made his first change, sending on Pandev for Kharja and then, after 73 minutes, he took off Cambiasso replacing him with Nagatomo. Sorensen's 75th minute error let Eto'o through on a run, but Buffon was quick off his marks to intercept. It was the Bianconeri goalkeeper who came to the rescue again on 82 minutes: Sneijder lobbed the defence to set up Eto'o, whose right-footed shot was deflected upwards by Buffon and Pepe was on hand to head the ball clear as Pazzini closed in. Inter's best chance came on 88 minutes when Maicon's low cross was met by Eto'o, who blasted his left-footed shot against the bar. It wasn't over yet though, because Eto'o shot wide after receiving an excellent assist from Sneijder, when he was unable to keep control of the ball with only Buffon to beat in the 90th minute. After four minutes of stoppage time Valeri blew the final whistle. 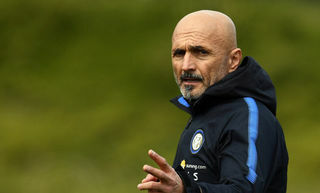 Inter stay on 44 points, 8 behind leaders AC Milan. Juventus: 1 Buffon; 43 Sorensen, 15 Barzagli, 19 Bonucci, 3 Chiellini; 27 Krasic, 4 Melo (Sissoko 74), 14 Aquilani, 8 Marchisio (Pepe 72); 20 Toni (Iaquinta 65), 32 Matri. Subs: 30 Storari, 10 Del Piero, 21 Grygera, 25 Martinez. 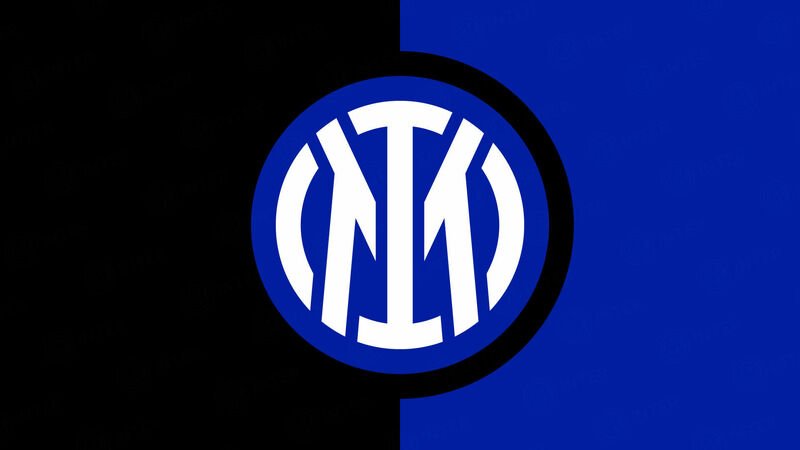 Inter: 1 Julio Cesar; 13 Maicon, 2 Cordoba, 15 Ranocchia, 4 Zanetti; 15 Kharja (Pandev 60), 8 Thiago Motta, 19 Cambiasso (Nagatomo 73); 10 Snejider; 7 Pazzini, 9 Eto'o. Subs: 12 Castellazzi, 20 Obi, 23 Materazzi, 29 Coutinho, 57 Natalino. Booked: 79 Sissoko, 87 Maicon, 93 Thiago Motta. Added time: 1+4. Leonardo: "This doesn't change anything"